"I feel quite honored and fortunate to have come so far and to play with such great musicians as I do." Brad Jenkins started studying and playing music at a young age in Canada. He is a versatile saxophone and flute player, who has recently played with such legends as Lester Chambers (The Chambers Brothers), Big Brother and the Holding Company, Barry “The Fish” Melton Band, Jerry Miller (Moby Grape), Terry Hagerty, Kieth Graves, Fuzy Oxidine, Harvey Mandel, Peter Walsh, Norman Spirit Greembalm, David LaFlamme (It's A Beautiful Day) with Linda, Toby, Val and Rob and Gary, Laurence Juber (Wings), Lacy J Dalton, Gary Duncan (Quicksilver), Les Dudek (Allman Brothers), Shana Morrison, Kathi McDonald (Brad recorded with Kathi and Sam Andrew on a CD), Essra Mohawk, Tyran Porter, Dale Okerman, Roy Blumenfeld (The Blues Project), David Aquilar (Norton Buffalo), Banana (The Youngbloods), Tony Saunders, Michael Hinton, Demitrius Lenis, Albhy Galuten, Greg Douglass, Andy Kravich, Ron Emerson, Jim Dyke, Dale Ziech, Jennifer Holt, Mitzi Crowely, John Gullic, John Davis, Dan Hennig, Mike Maran, Sam Fandangle Jake, Boogie Bruce, Mr Tim, Nose and the other Dirty Butter Band members, Bob Brozman, Slim Chicken, Clifton Shineer, Tom Crow, Judge Murphy and Lansdale Station, The Non-Prophets, Marjo Wilson Band and many more. Having experienced everything from Criteria Studios in Miami in the early 70s to the San Francisco Rock & Roll scene of the 60s, Brad has developed a unique soulful style. During the late 70s and early 80s Brad played with several working bands touring the country, including Cruz Control, The Reactors, and Vout n About. Brad's journies in music have revealed memorable connections; he has been fortunate to meet some of the greatest in the industry. From meeting Count Basie in 1986 to living with the founding members of Criteria Studios fame, the stories are endless. In 2007, Brad donated and built the website for the Summer of Love 40th Anniversary. 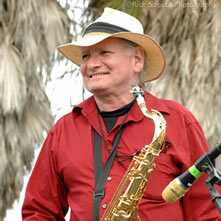 He also had the honor of playing with Essra Mohawk in the morning of that day and later with The Jerry Miller Band. Over the years Brad has been a sound engineer in various situations. He spent several years as sound man for Henfling's in Ben Lomond CA. Many world class musicians passed through and were mastered by Brad. Brad Jenkins will be travelling to Maui early 2016 to perform live with local players there. © All Rights Reserved - Contact Brad Jenkins to play Saxophone, Flute, Clarinet, Keyboards or Vocals.